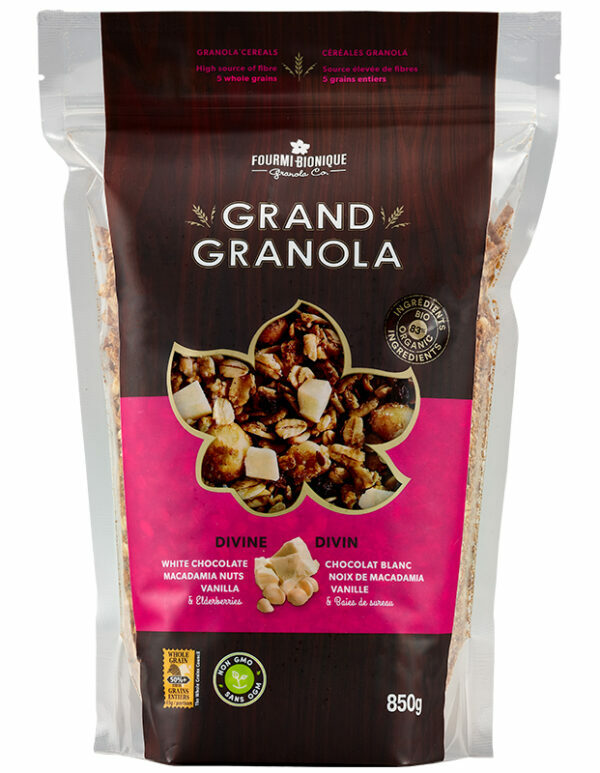 You will pray for more when you taste this Divine granola blend. 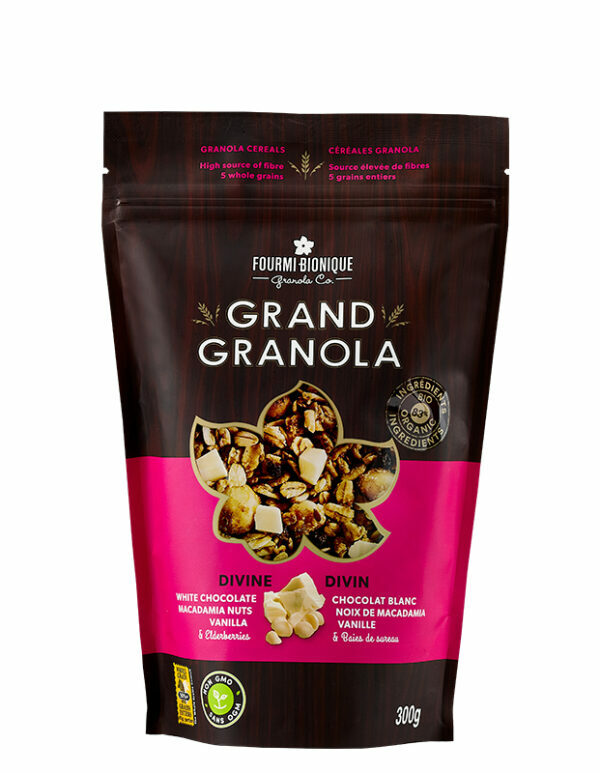 Made from a blend of organic cereals sourced from Quebec, the Grand Granola Divine will transport you to a cloud of sweetness with its macadamia nuts, white chocolate chunks, soft vanilla aroma and a hint of organic black elderberries … A true revelation. This rich and creamy cereal blend is a real delight with soy milk, and the red fruits complement it perfectly. The tasty notes of vanilla blend beautifully with white chocolate and macadamia nuts. A taste of paradise! For more ways to enjoy this blend, try our easy and original recipes. This product is certified by Ecocert Canada for its organic ingredients, Kosher Dairy by COR, and Whole Grains by the Whole Grain Council. It is also available in an economic and recyclable bulk packaging and offered in the NUTBROWN grain-free and gluten free granola range. Rolled oats*°, Sugars(honey°, cane sugar*), Whole spelt flour*°, Sunflower oil and/or Canola oil, White chocolate* (sugar*, cocoa butter*, whole milk powder*, soy lecithin, vanilla extract*, ground vanilla*), Rolled rye*°, Rolled barley*°, Oat bran*°, Tamari* (water, soybeans*, wheat*, salt), Coconut*, Macadamia nuts, Flax seeds*, Sesame seeds*, Natural flavour, Cocoa powder*1, Elderberry powder*. May contain almonds, cashews, hazelnuts, pecans and ingredients made in a facility that processes peanuts. Sweet-cream white chocolate melts to the persuasion of rich roasted macadamias and perky caramelized elderberries. Helps fight bronchitis, sinusitis, sore throat and colds.